This is my song today. This is my prayer today. 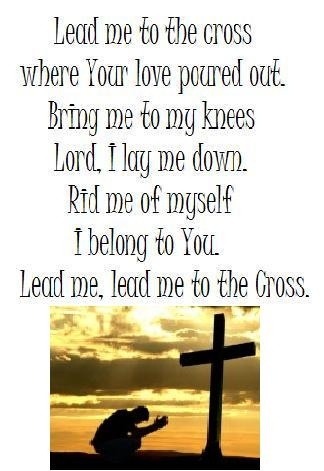 That God would lead me to the cross where Jesus died. That I would recognize how much God loves me and gave His own Son for my forgiveness. That His love pours out and is immeasurable...more than I could ever imagine. That what I am means nothing without Jesus Christ saving me. That, just as Luke 9:23 says, "Whoever wants to be my [Christ's] disciple must deny themselves and take up their cross daily and follow me [Him]." How could I pick anything or anyone besides Jesus? How could anything take His place in my life. I pray that God "rids me of myself," all my selfish desires, and all the clutter that gets in the way of my relationship with Him. Because it isn't worth it. I belong to HIM. I want to be rid of myself. I want to be filled with more of Jesus, less of me. I want my faith, hope, joy, and love to be increased in Him. I want Him to be shown through all I do today. I am asking Him for His strength to help me lay myself down, surrender myself to Him, and truly belong to Him each and every day through my words, thoughts, and actions. Amen.